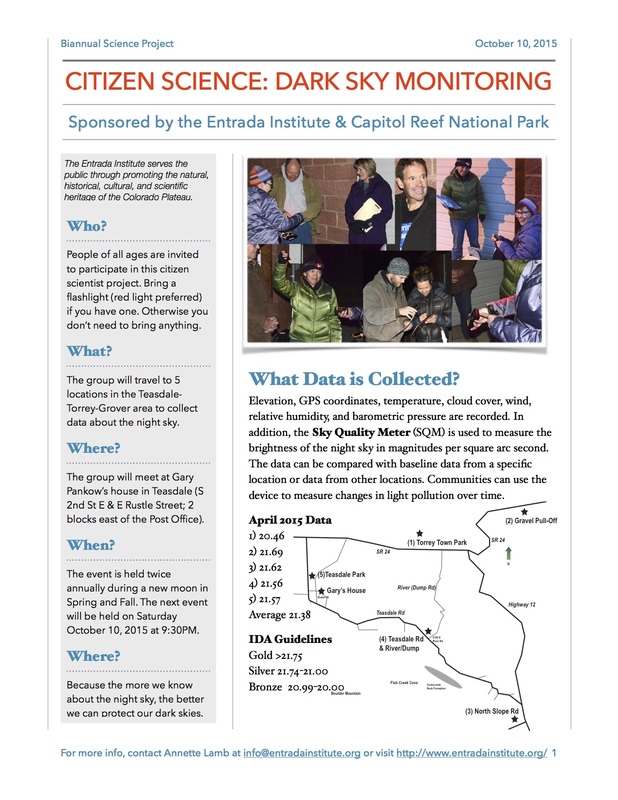 The Entrada Institute celebrates the dark skies of the Colorado Plateau through a variety of projects. Heritage Starfest promotes the scientific and cultural heritage of dark skies over the Colorado Plateau with a two-day festival in partnership with Capitol Reef National Park. This festival is held during a new moon each Fall. Dark Skies Over Torrey Initiative promotes economic development activities related to astro-tourism by working with the local community to promote dark sky friendly lighting. To learn more and/or contribute, go to Dark Skies Over Torrey. Other Night Into Day Projects are woven into other programming such as a proposed “night sky interpretive pathway walk”. During the Arts and the Park event, it was suggested that watercolorists consider creating works featuring the night sky. The image on this page is an award winning watercolor by Linda Flannery titled “Torrey, Torrey Night” from the 2016 event.